Heirlooms aren’t like antique cars— there is no real age standard. Poundsweet is usually considered by all to be a true “heirloom”. Grandpa often receives questions from people who believe heirlooms are better than “new” varieties that are offered in the stores now. Often, they are confused by the overwhelming hype (“Hubbub”) over the GMO controversy and think that everything new can’t be good. Some varieties have been grown for years and are widely available in the marketplace, but they have been around for over 100 years. For example, let’s take a look at the Delicious apple. The original Hawkeye apple, renamed “Delicious” by Stark, originated in Iowa in the 1880s. Delicious is over 125 years old, thus undoubtedly qualifying it to be a “heirloom” by just virtue of its age and special value. 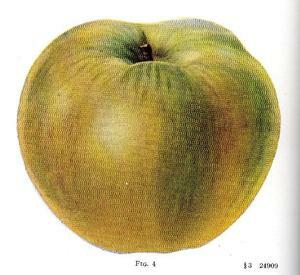 However, since its introduction many variants of the original Delicious apple have been introduced to the market. Genetically it varies very little from the original parent. The “Red Delicious” apple you buy in the grocery store are not at all like the old “Hawkeye” that it descended from. All of these Delicious variants occurred by chance with genetic variations in nature, not by breeding, but by selection. Resulting in far improved red color typical of the apple, sturdiness of the branches, and other things that made it easier for fruit growers to produce and market a fruit that was more desirable to consumers. Some varieties are “brand new”, and have such special value that they will undoubtedly be handed down from generation to generation. Honeycrisp is an example. Released in 1991, it has revolutionized the apple industry and taken consumers by storm. Its crispness and crunchiness set a new standard for new apples of all types. But by being “new” does that disqualify it from being “heirloom”? Often people confuse “heirloom” with being “good” and “GMO” with being “new and bad” just by virtue of their personal perception and opinion. Grandpa isn’t going to get into any arguments, except to say that none of the varieties he offers, or any of the rootstocks they are grown here are considered “GMO” by the most widely understood definition of the term. In truth, humankind has been selecting fruit and vegetable varieties, farm animals, flowers and other plants by virtue of their genetic expressions for thousands of years. When Mendel worked with peas, he started the modern genetic revolution we have benefited from. Scientists have been using “natural” methods of genetic modification for hundreds of years by actively crossing one variety with another and selecting progeny with better characteristics. It has just been in the “modern” age that scientists have understood genetics at a more basic, molecular level, and have had the tools in the lab to “un-naturally” make genetic changes to varieties. Usually, these changes have resulted because the natural sexual processes that have been used in the past to make crosses have been replaced with inserting genes in ways that might normally not ever occur in nature. The issue tends to get very complicated. In the fruit industry, it has not become an issue just yet, but it might be in the future. It all depends on your own perspective, and what constitutes modifying an organism in such a way it appears unacceptable to most. Grandpa doesn’t offer any GMO varieties and doesn’t plan to. All the varieties he offers, whether considered “heirloom” or “new” are the result of natural and conventional breeding or discovery.